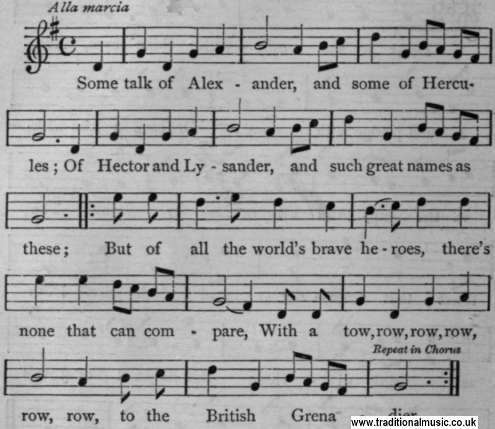 Those heroes of antiquity ne'er saw a cannon ball, Or knew the force of powder to slay their foes withal ; But our brave boys do know it, and banish all their fears, Sing tow, row, row, row, row, row, for the British Grenadiers. Chorus�But our brave boys, &c.
Whene'er we are commanded to storm the palisades, Our leaders march with fusees, and we with hand grenades ; We throw them from the glacis, about the enemies' ears, Sing tow, row, row, row, row, row, for the British Grenadiers. Chorus�We throw them, &c.